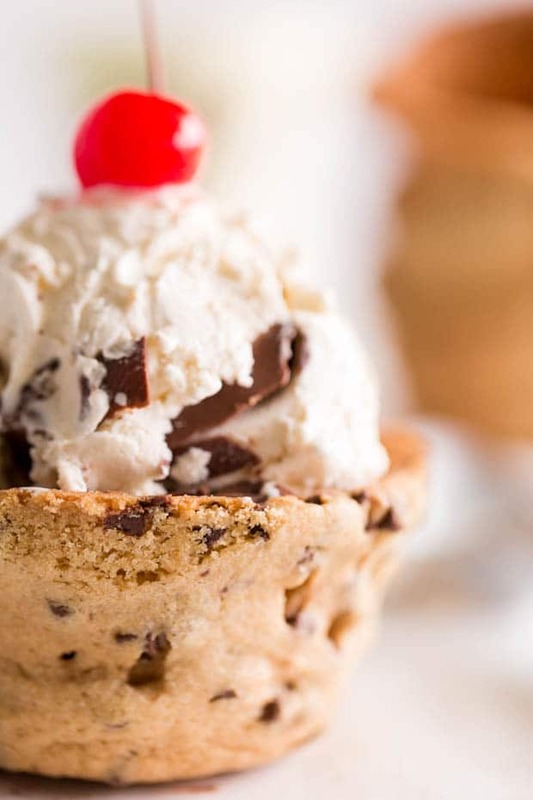 This easy homemade Chocolate Chip Cookie Cups and Ice Cream recipe is the best!!! Recently, I was craving chocolate chip cookies in a big, bad way. You know — hot, fresh, chocolate chip cookies from scratch. Not a mix, not a pre-made dough. The real, simple, homemade stuff. I also wanted ice cream to go along with. Because in my family, ice cream is a main food group. I’m not kidding. There are family stories about how my mom ate ice cream for breakfast, lunch and dinner while in college. Like by the pint. Sometimes in ice cream cake form. Note: by some incredible genetics that skipped me, she stayed thin. Life is not fair sometimes. Needless to say, ice cream is a big deal in our family. 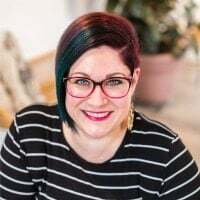 I’m excited to partner with Mirum to bring you this delicious idea! So… back to my craving. When any big craving hits, I take it seriously. 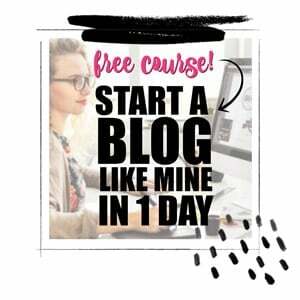 I jump on Pinterest and start researching the best way to handle the situation. I started seeing cookie bowls pop up in my search results. Lightbulbs went off and the sky parted and I could hear angels singing. Cookie cups and ice cream. We’re onto something. Then I got a little nervous and thought, “are cookie bowls worth the effort”? Oh, yes, my friend… oh, yes. Let me tell you: I nailed it with this cookie bowl recipe. I’ve heard some horror stories like, “we had to do this recipe 5 times not to have a complete Pinterest disaster”. Not with this. 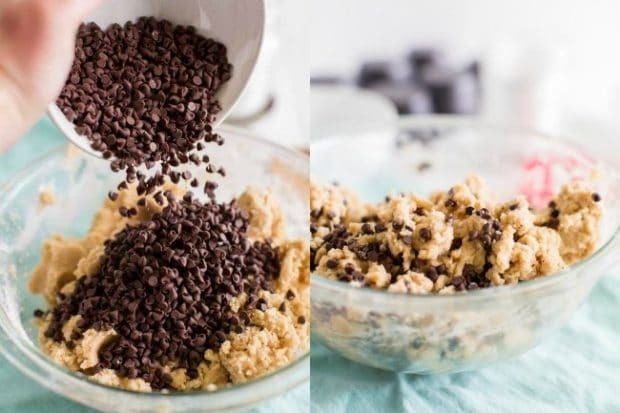 This chocolate chip cookie bowl recipe is easy peasy. Stick with me — these cookie bowls paired with ice cream will make all your dreams come true. Like I said, ice cream is a pretty big deal in our family. Everyone gets their own pint. One of the most frequent ways you can find us enjoying a creamy frozen treat is with a trusty spoon and a paper towel wrapped around the container to prevent any frost bite on your fingers while eating. Told you… we’re serious about our love affair with ice cream. Just when I thought my favorite couldn’t get any better, Magnum Tubs made their entrance into the world. Chocolate Raspberry. They’re made with Belgian chocolate. I’ve taken it upon myself to try all of them so that I can assure you they are each excellent. You can head to your local Wegmans to snag your own containers to try. 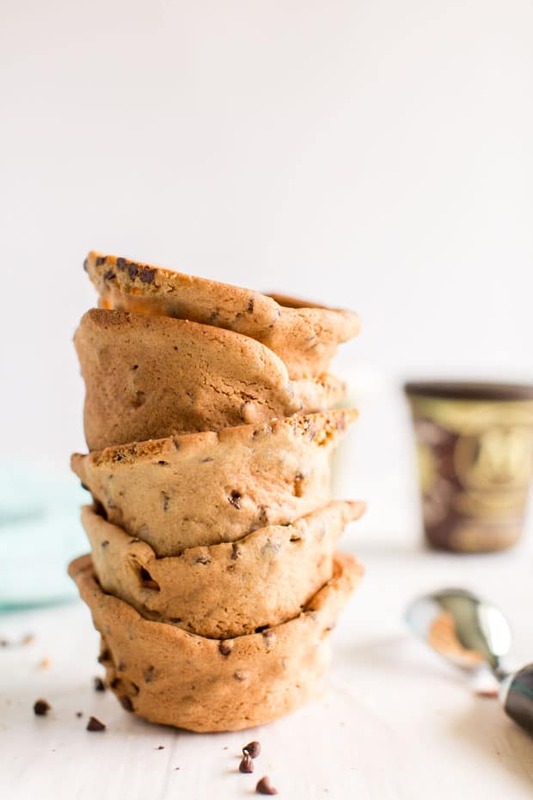 You’ll want to grab your favorite flavor before making these chocolate chip cookie cups for ice cream! Because I was craving this big time, we headed to the store at 9pm to grab ingredients. 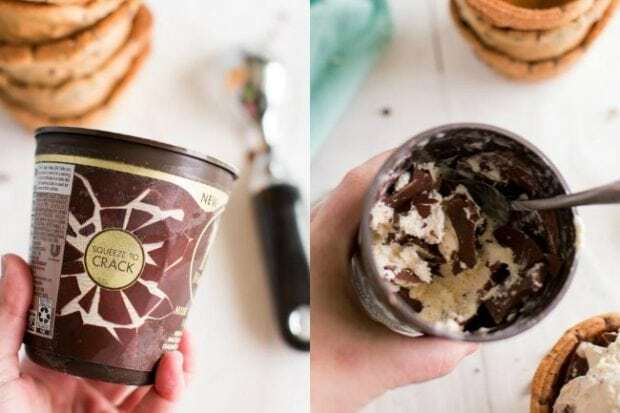 I needed these cookie ice cream cups to happen pronto. 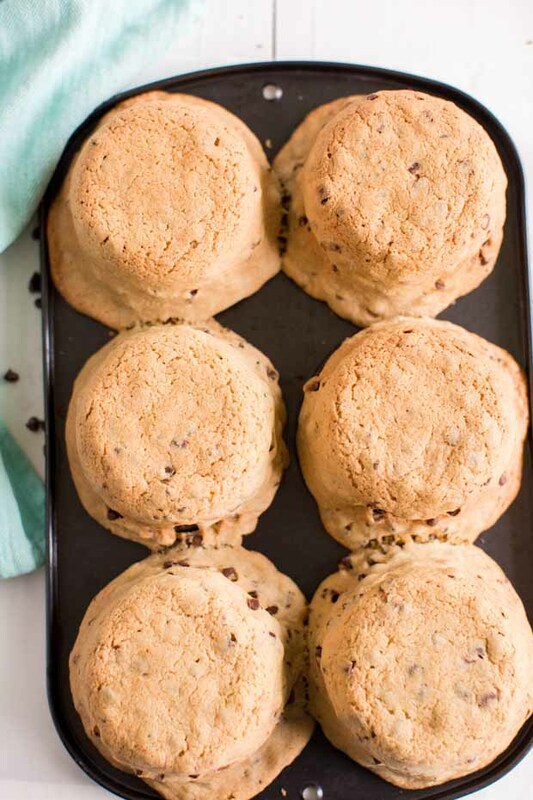 You’ll be using butter, an egg, white sugar, brown sugar, vanilla, flour, salt, baking soda and mini chocolate chips. 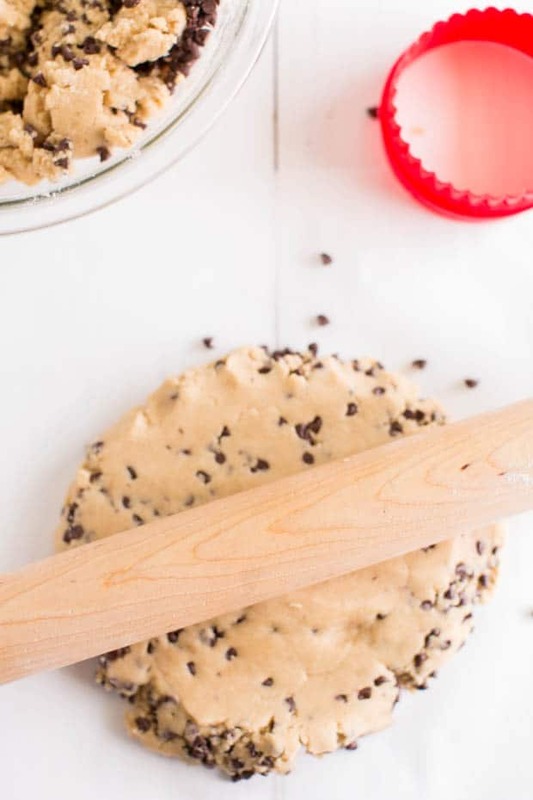 This recipe starts out just like a traditional cookie dough. In a large mixing bowl, beat together butter and both sugars until creamy. Add egg and vanilla and stir until combined. With the mixer on low, slowly add dry ingredients to wet. Mix until the dough comes together. I have shied away from trying to make an edible cookie bowl for awhile. It made me nervous. It’s SO worth it though. I promise! And it’s not nearly as challenging as I made it out to be in my head. Once your dough is ready, here’s your next steps. Turn dough out onto a piece of parchment paper and roll out to ¼ inch thickness. 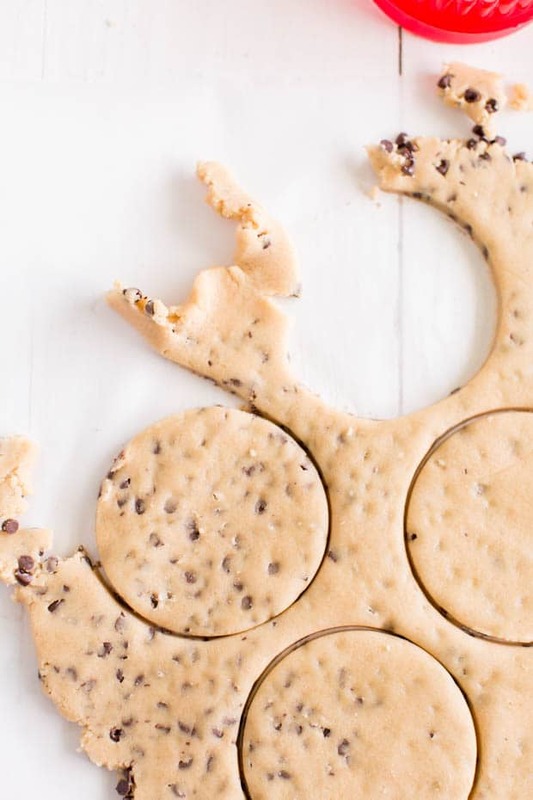 Using a 4 inch round cookie cutter, you’ll cut out circles. Gently press each circle of cookie onto an upside down jumbo muffin tin. The dough will be drier than usual so you’ll have to be very gentle with it. Allow to cool and gently remove from pan. Voila! You now have yourself a cookie in a cup! You could also purchase a cookie cup mold if you’d prefer to use that over the muffin tin method. Since I have a plethora of muffin tins in various sizes, I was happy going that route. Grab your favorite flavor of Magnum ice cream and scoop into your cookie bowl. 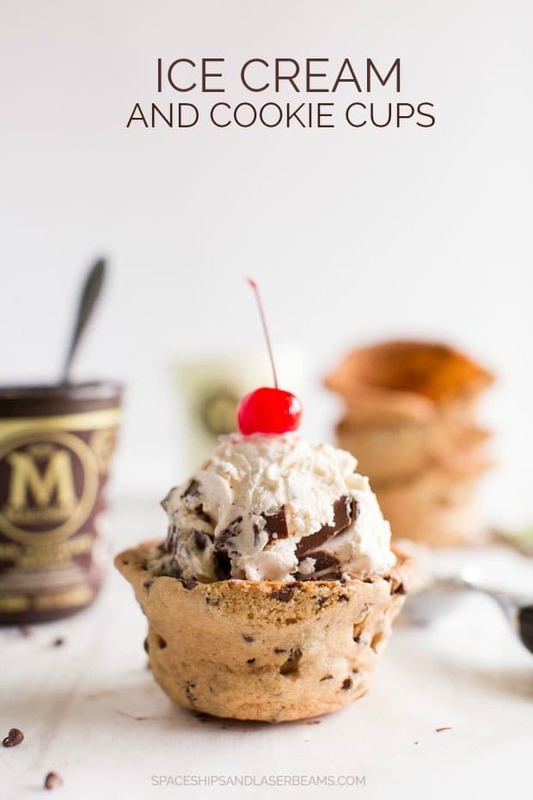 You could get really creative and make ice cream sundae cookie cups and provide toppings along with the cookie cups and ice cream. I know my boys would go wild for this option. Toppings could include hot fudge, caramel, chopped nuts, whipped cream, cherries, strawberries, mini chocolate chips or pineapple. But mama loves them easy: just a warm cookie cup and creamy, cold ice cream with a cherry on top makes me so happy. Using a 4 inch round cookie cutter and cut out circles. 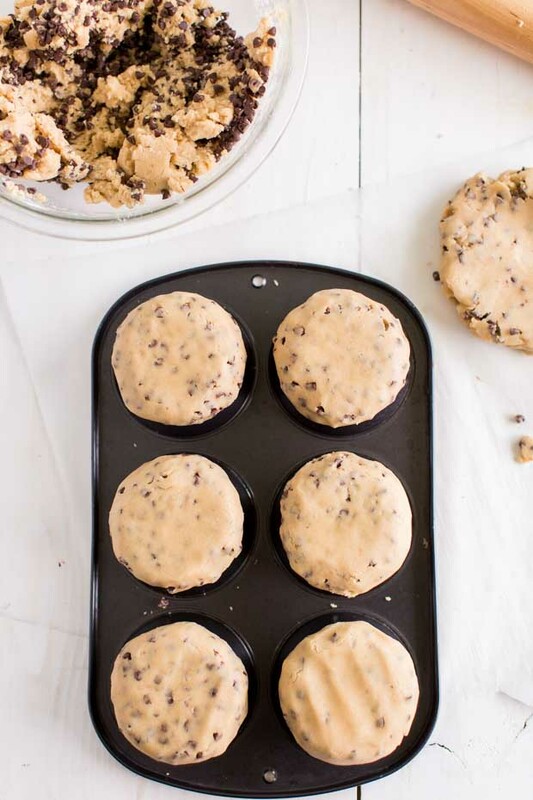 Gently press each circle of cookie onto an upside down jumbo muffin tin. The dough will be drier than usual so you’ll have to be very gentle with it. super delicious! this recipe is perfect to my kids! Looking yummy! Do you know if there’s a way to make chocolate cookie cups? I’m sure you could adjust the cookie recipe to have it be double chocolate but I haven’t tried it like that yet! 🙂 Enjoy!